I'm back to making Christmas cards...on Merry Monday a great challenge to inspire and get you started on your own Christmas card list. 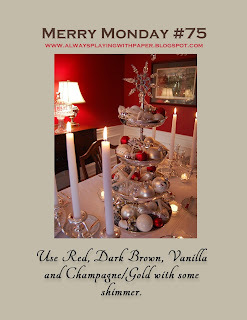 I was inspired by the lamp the candlesticks and the lovely sparkling ornaments. I drew the lamp and used my stylus to shape it after attaching it to the black base cut. Pretty quick and easy card for my list. Looking at the photo...I'm picturing this card with a red base and a brown frame. I might have to do another one. And now on to other ramblings feel free to scroll on by and leave a comment or question... I will respond kindly. Pictured below another silhouette and the amazing water droplets stamp I just got and couldn't wait another minute to test it. I was heat embossing these weeds when the mailman arrived with my purchase...woopee....with a ready to be reclaimed card base and gray ink I stamped the first image. Then I repeated with fresh card stock. I love it. Being a water sign... Pisces I'm attracted to anything water related. I was away from my computer for about an hour and a shower so now that I'm back....I think the purple thread will have to go. And up last is this pumpkin colored card with a web of cheese cloth. Blogging seems less stressful with a tidy space. I mean did you see my space? Previous post before and after shots. 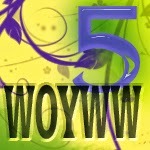 The fun thing about WOYWW is so many bloggers are willing to spend the time to read and comment. So thanks Julie and all you snoopers...you are super. Carol, simply smitten with your winter scene for Merry Monday! Just want to climb onto the warm setting! You made that lamp??? WOW!!! That droplet stamp is amazing with your sweet silhouette, and your halloween card is too adoreable to be scary! Love all those web like touches! three fabulous cards!! Love your Merry Monday scene! Wonderful cards Carole! I love the first one just like it is and the red just pops! If you make it the other way let me know I would love to see it. I love this one though! Love the gauze on your Halloween card. What a beautiful Christmas shelf, Carole! And I love what you did with the water droplets and the fantastic Halloween card! So glad you shared with us at Merry Monday this week! Wow....you don't need a Cameo with such talent as the lamp. Love Love the card and the mirror mantle...gosh! I love the hint of purple on the flower and now I see that fun ghost card from your desk of goodies. I didn't find any cheese cloth in the piles and piles and piles and piles of stuff I was throwing away....haha .... go figure. A beautiful collection af amazing cards.Love the unique great christmas collage card and the water drops in background of the wonderful flower card. The spooky card is gorgeous. Love the Merry Monday card, your lamp is amazing and the use of the challenge colours is so pretty. Love your take on the inspiration photo. I cannot believe you created that lamp, so cool!! Thanks so much for sharing this with us at Merry Monday! The glitter berries are so pretty! Oh My Word....yal will have such an awesome time. I love the idea of your birdhouse crafting project for people who want to join. I swear I don't think we have anything around here. We have state parks but nothing this nice closed in like your pavilion you are showing. Heck, I don't have enough relatives to make this big a shindig. Love your "window" scene ....the red berries really "pop"! Wonderful cards Carole, I love the mantel scene you have created. Thank you for joining us for Merry Monday this week. Love your cards and that card for the merry monday is so beautiful gives a very warm feeling. Great cards. Love the scene you created on your Merry Monday card. Very pretty. The water droplets card looks like real water. Cute halloween card. Thanks for sharing with us at Merry Monday, I love the berries and the embossed sentiment.